Germany has the most incredible Christmas markets in the world, the way I see it. Weihnachtsmaerkte in Germany remain unique. 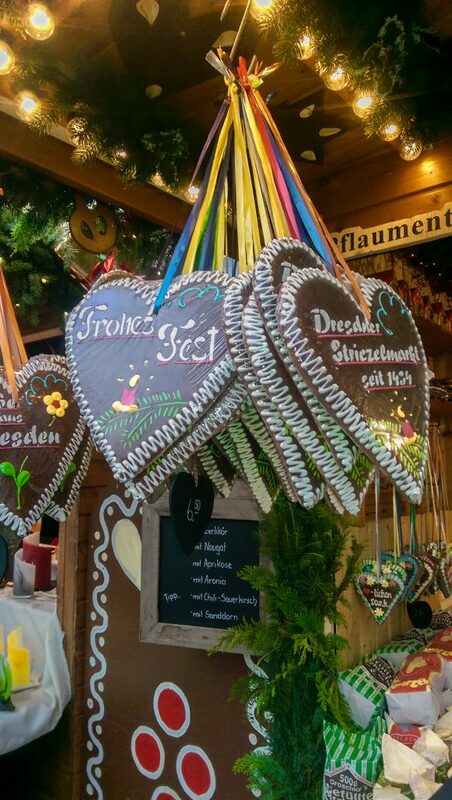 If you’re tired of commercialism taking over festive season and would like to see a real traditional and romantic Christmas Market you might want to consider heading to Germany in December, where Christmas gifts are not mass-produced but craftwork of real quality (at least the majority of them). There are more than 2600 Christmas Markets opened across Germany, and each single one of them appear special among the others. Perhaps it is about the people and the festive atmosphere or maybe it is the mulled wine, but December is my favorite month of the year and I am incredibly grateful I get to spend it in Germany! Dresden has the largest number of Christmas markets in the eastern part of the country and is one of the cities that are able to lay claim to the title of being the oldest seasonal event in Germany. The Striezelmarkt had its beginnings back in the 15th century, and people do everything in their power to underline this fact! I like Striezelmarkt because it allows you to explore the whole city, and believe me – it is something worth seeing during the festive time. The market is placed not too far away from the major attractions and from the river – available within walk-able distance ( perfect walk with the mulled wine). As for the food – usual German Glühwein (mulled wine), sausage stuffing, red cabbage and potato dumplings. Dresden has also got some Russian-inspired ideas, such as famous Soljanka soup – it would make a perfect warm-up meal, especially for the long festive sight seeing. 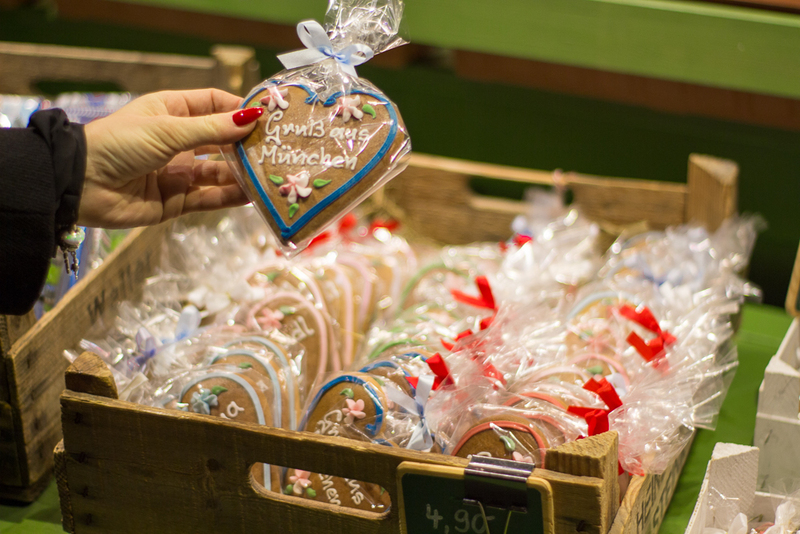 Apart from that you can buy heart shaped gingerbread with the beautiful ornaments as a souvenir and hang it in your house for the festive time. Ah, and don’t forget about the famous Dresdner Stollen ( delicious fruit loaf), which is probably the best known German dessert served for over the Christmas period. Is it worth coming here from far away? Well no – it isn’t just for this particular market. It is worth coming to Dresden from the other side of the world for the experience. 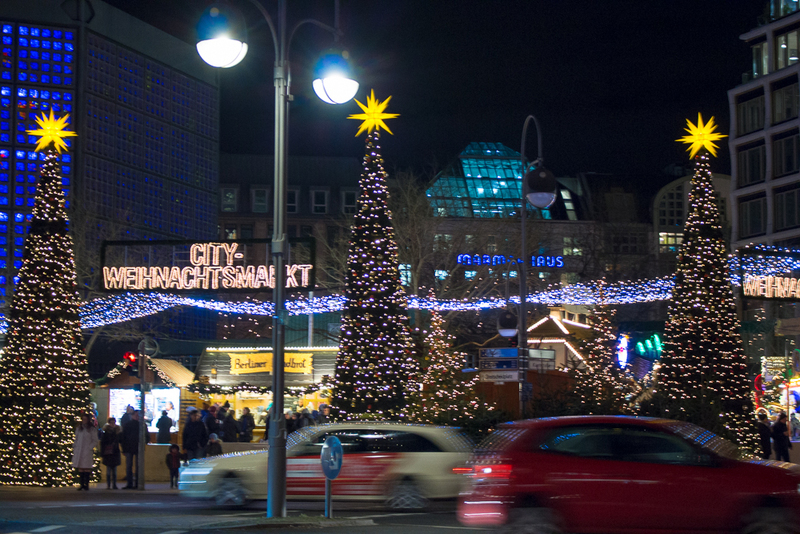 I think seeing the beautiful ornaments and feeling the festive vibe of this beautiful German city would undoubtedly make an unforgettable reliving! 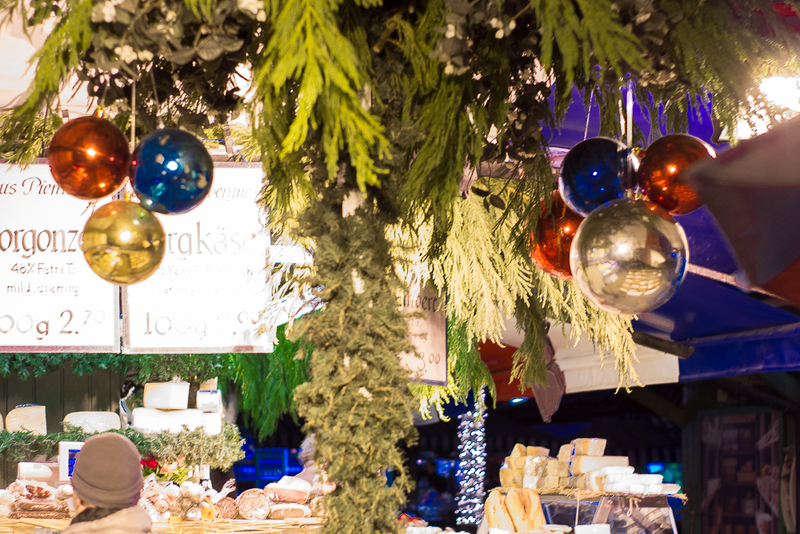 Viktualienmarkt is one of the most popular markets in Germany in general, but in December it is all dressed up for Christmas and the atmosphere of the place is just incredible! Why do I think it is so special? 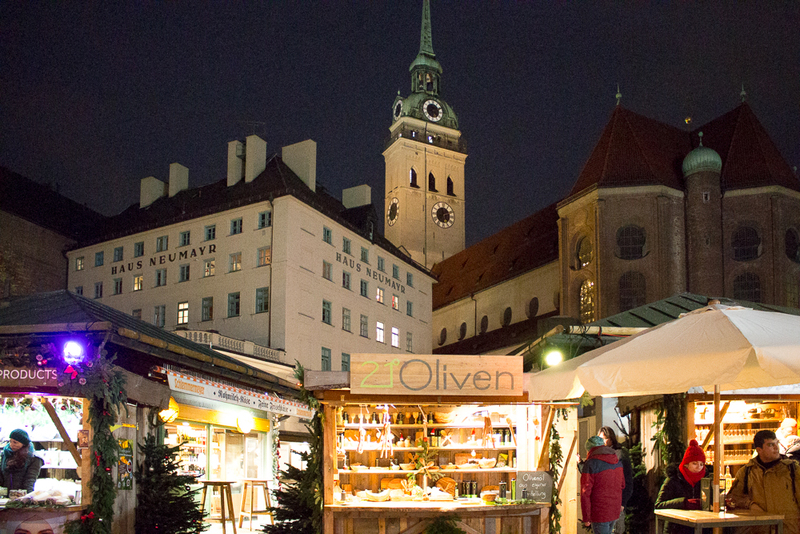 It IS a market with some great traditions, dating back to the 19th century ( Viktualienmarkt was previously placed in Marienplatz). What was quite surprising is that it appeared empty in compare to the other European Christmas markets I have been to – does it mean it is not as fabulous? I simply assumed people couldn’t be bothered to go out at the end of November, and it will get super crowded at some point. I figured this particular Christmas market is different to the rest of them in terms of the Christmas shopping purposes. You can obviously get some lovely Lebkuchen (gingerbread), Bratwurst or Kartoffelsalad, but Viktualienmarkt is so much more then that. We found some super delicious honey, Swiss cheese and super fancy festive Crocks (great gift idea!). Apart from that, there are some lovely Christmas trees, dried fruit, olives, pizza (I know :P), wine, more wine and some wine. This place has a soul! 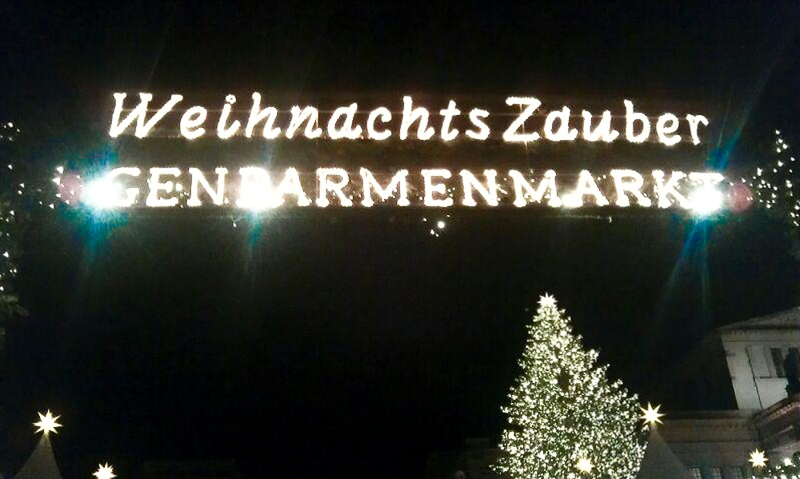 As for me, THIS IS THE MOST MAGICAL Christmas Market I have been to. And the busiest as well, unfortunately. Gendarmenmarkt is Berlin’s most beautiful square. It is the site of three impressive buildings : The German and the French Cathedral and Schinkel’s Konzerthaus. To me it looks incredible during all four seasons of the year, but Christmas makes it totally magical. It looks like a fairy tale, with all the beautiful ornaments, music, Christmas tree and Glühwein. For the ones coming to Berlin for a brief visit, Gendarmenmarkt is located just stone’s throw from the Brandenburger Tor and Unter den Linden. 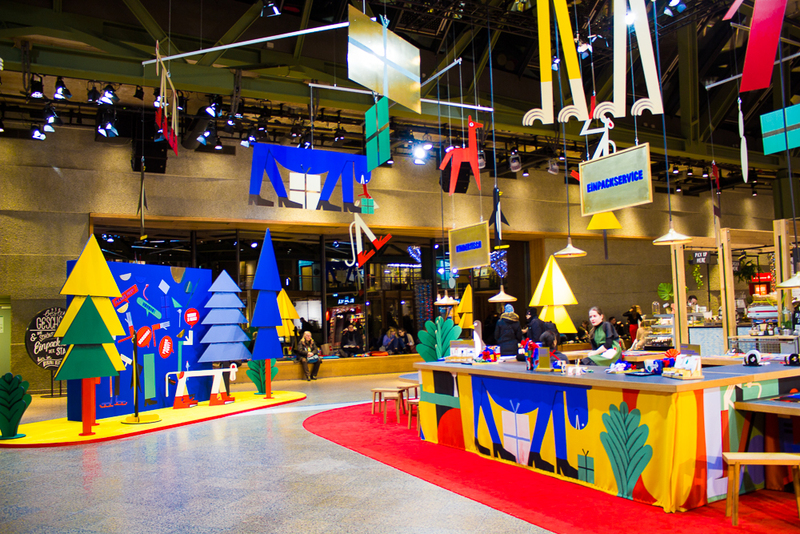 It has goat loads of world class restaurants on every corner, but you probably won’t need them – get some super delicious German festive specialties on the Market. 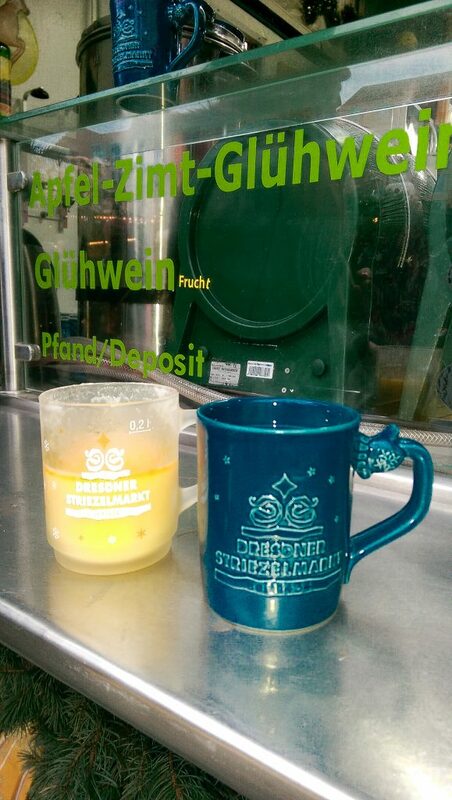 Get a little Gendarmenmarkt mug as a souvenir – simply order some Glühwein and keep the mug ( it’s not a theft as you will be asked to leave 1€ Pfand). Unlike Gendarmenmarkt Christmas Market, the one on famous Ku’damm is not the most beautiful, nor it is the most unforgettable. I think, however, this particular square is the heart of Berlin. It is so lively, so ‘cool’ and located in the most strategic place in the city. I like stepping by, even in the summer, to just sip red wine and watch people passing by. 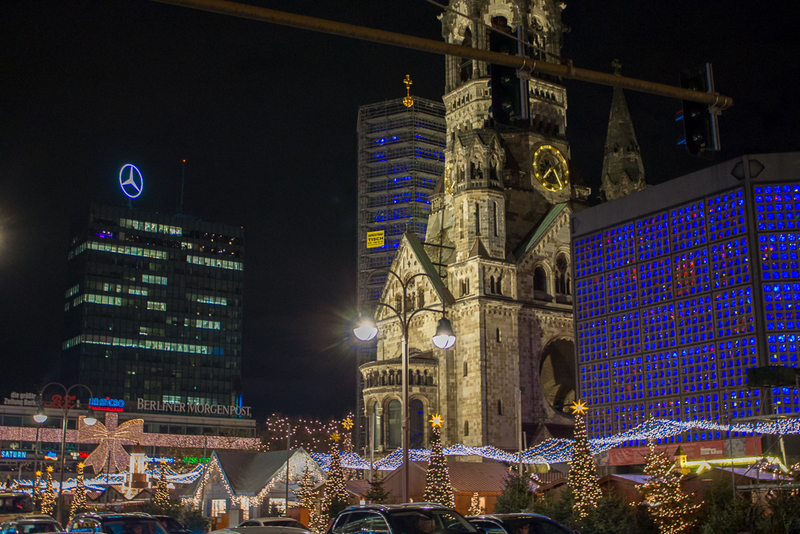 In December it is even better – with the mulled wine and the beautiful Christmas lights the world looks unrealistically astonishing, especially in Berlin. Also – my favorite shopping mall in the world, Bikini is just opposite the market. There are some great concept stores ( Bikini is the largest concept shopping mall in the world), featuring some of the most creative Christmas ornaments I have ever seen. In 2017 you are able to see ( for free) super colorful Christmas figures. 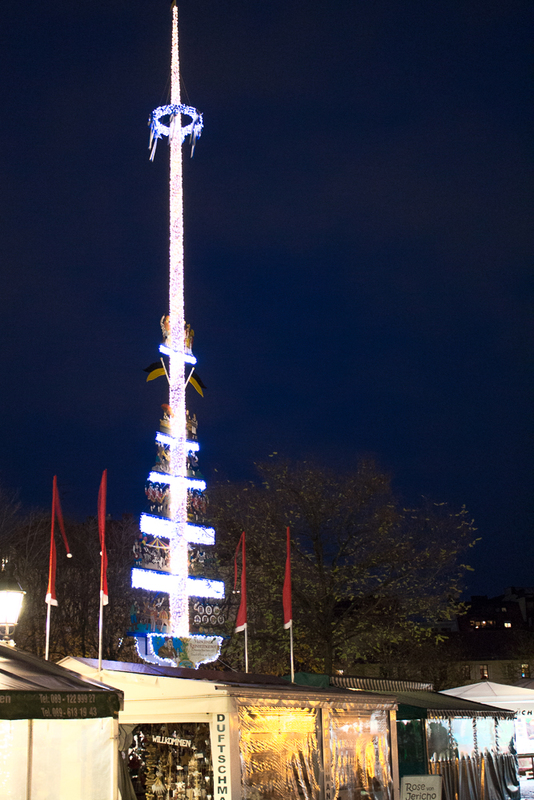 I’m a big fan of Christmas markets, and your pictures makes it that much more enticing to visit those 3 German ones! 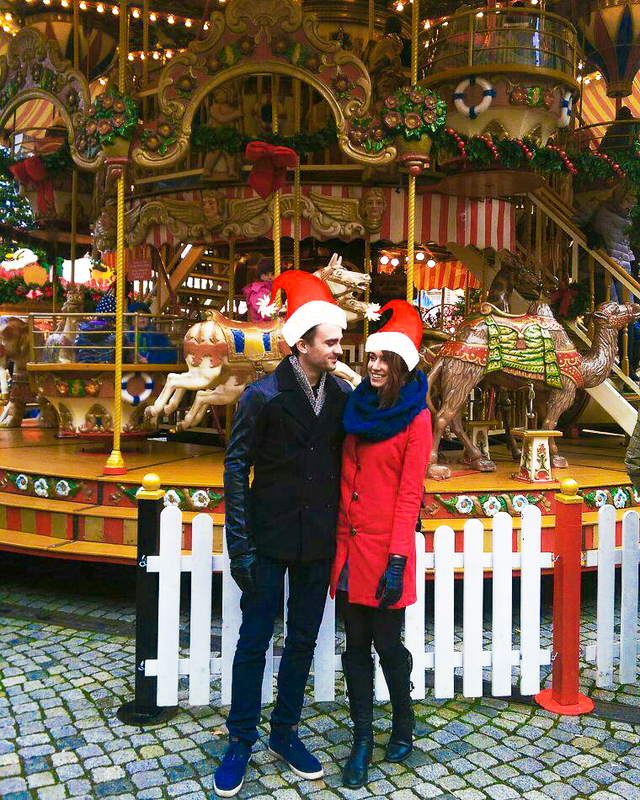 Christmas markets in Germany look like so much fun! I’d love to go next year!! 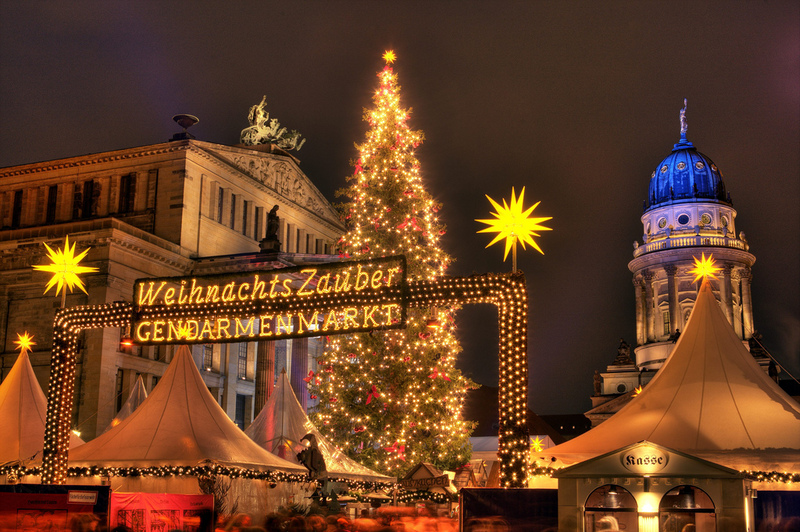 I really enjoy Christmas markets but not been to one in Germany yet, would love to go! Reckon Berlin would be my cup of tea, love the city. That is for sure <3 Visit Berlin! Oh there is no better European country to go to in December <3 amazing! Aww I always wondered how the real Christmas markets compared to the ones we have in the UK, thanks for telling us all about them! They do really make it sooo festive. Wow this looks awesome! I’ve always wanted to go to a German Christmas market, but living in Asia has made it hard to get over to Europe. Maybe next year will finally be the year. Christmas markets in Germans Cites look very beautiful. Beautiful! 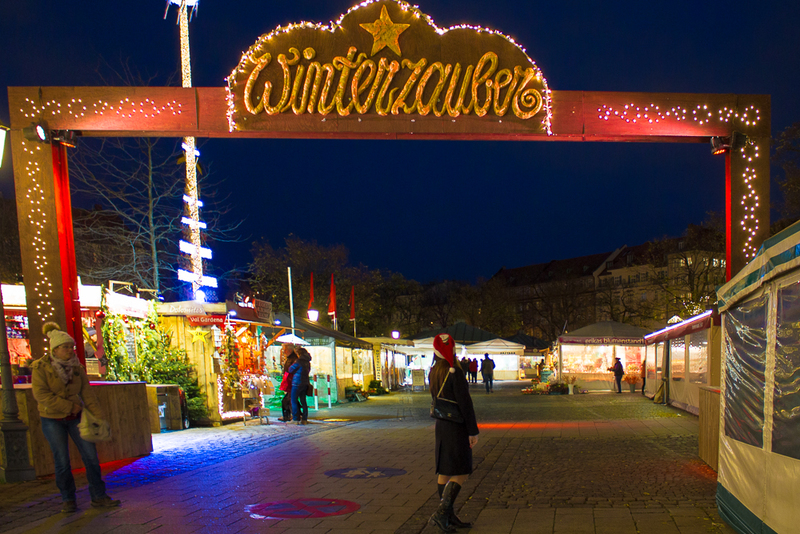 Germany is renowned for its Christmas markets. I have yet to visit Munich and Dresden’s markets. Need to add these to my list. 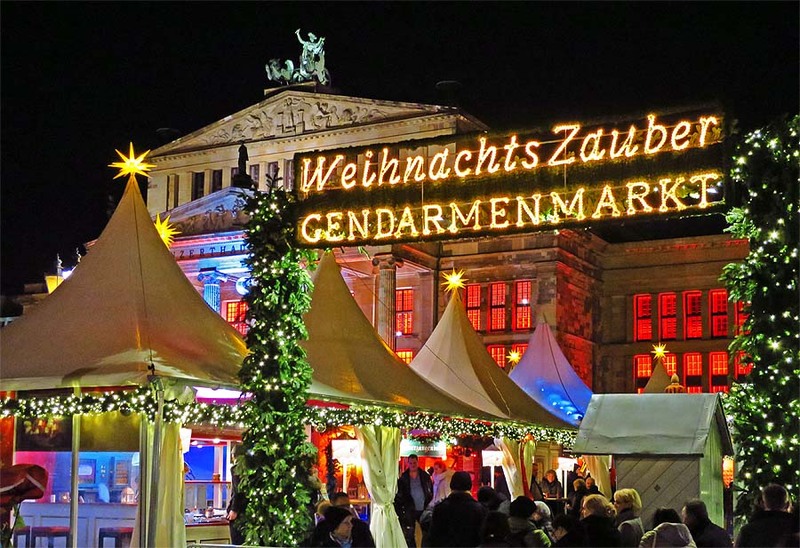 I’ve always wanted to go to a German Christmas market! I’m definitely saving this for next year, especially the one in Munich! Thank you for sharing ? Omg this looks so festive and fun!! I loove German Christmas markets! Have to visit one or two soon! Wow! Each one of these Christmas markets seems astonishing, Claudia. Germany is definitely Christmas wonderland. Is the mulled wine there good? Next year you have to come! This place looks magical, and you two look sooo adorable out there! WOW que lindo todo, me encanta todo lleno de navidad y de luces, precioso. Such an awesome place to shop for Christmas 🙂 Lovely pictures 🙂 Lovely post! Gorgeous! The markets in Berlin look so gorgeous!